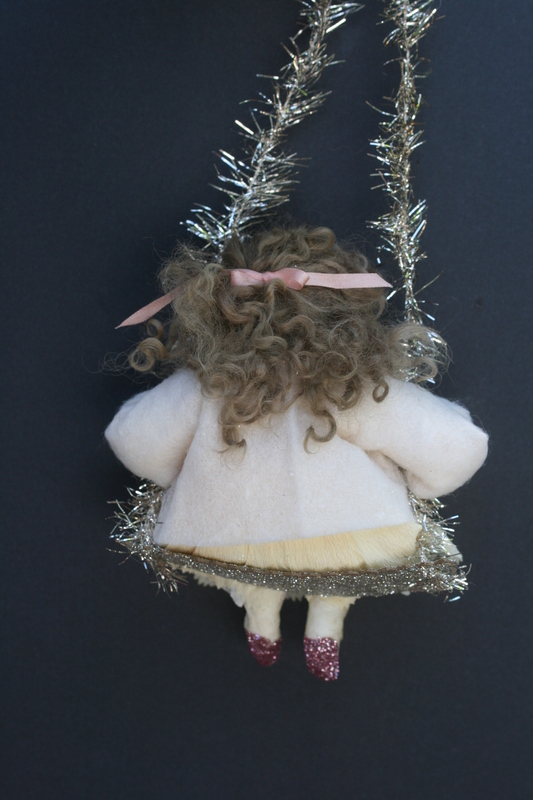 A look at my newest ornament designs. Not Quite Spun Cotton Ornaments… But Almost! Here are my two latest works! I finished them yesterday afternoon. Surprisingly enough they are not left over projects that I didn’t get done before Christmas, they are actually brand new creations for Christmas 2014!!! 🙂 The bizarre calendar of magazine deadlines strikes again! A. 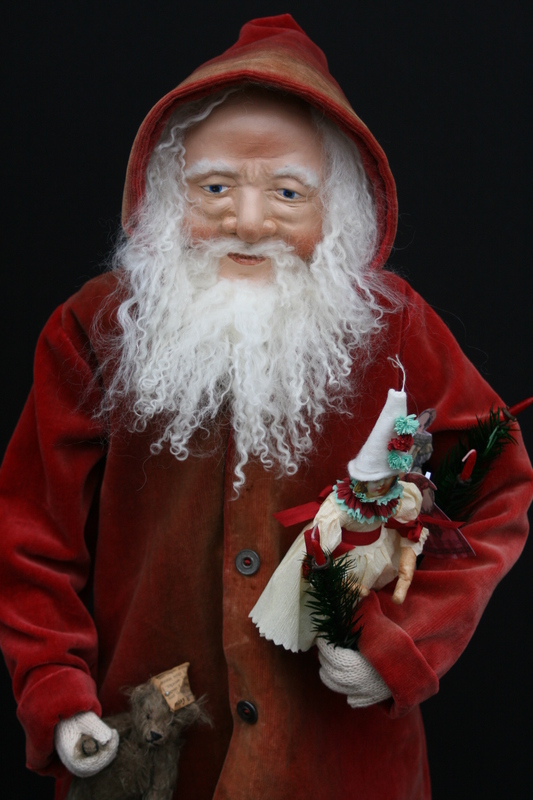 This is a 24 – Inch tall Father Christmas figure. I sculpted the head of this figure from polymer clay, then primed the clay with multiple coats of gesso and painted it with artist oils. 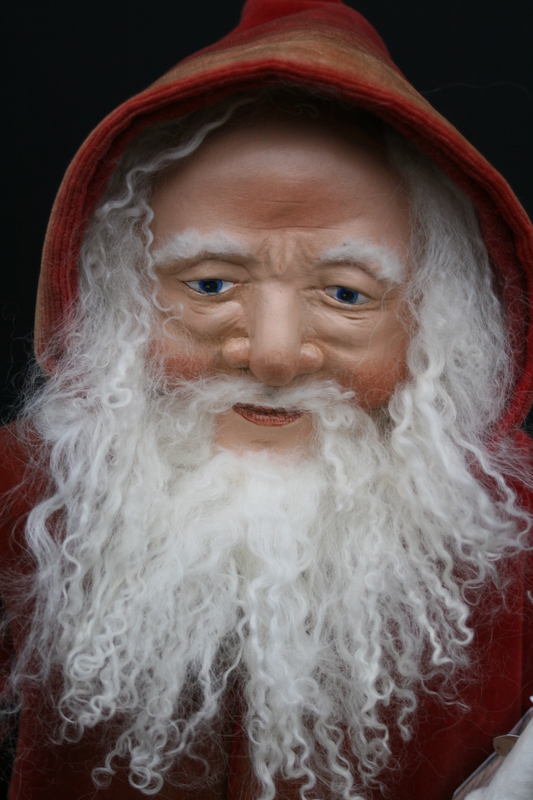 His hair, beard and eyebrows are made from individually hand applied strands of kid mohair. A wood armature supports the sculpted head and shoulders of the figure and forms the core of the torso and legs. The arms and hands have wire armatures, with individual wires for each finger and thumb, which allows the hands to firmly hold objects. The boots are hand sculpted. His coat is made from antique red velvet that was originally a curtain (which had been damaged beyond repair), it has antique metal buttons and a hood lined in wool that I hand dyed to match the velvet. He wears pleated trousers made from the same hand dyed wool that lines his hood. 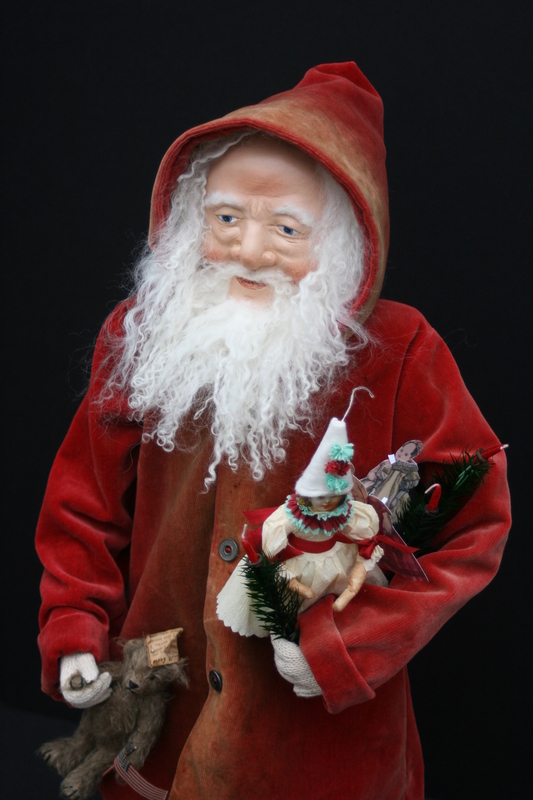 In one arm, Father Christmas carries and hand-made spun cotton girl, with a lithographed face, dressed in crepe paper, two hand – made paper dolls that are based on mid-nineteenth century originals, and three tiny feather trees, topped with candles. In his other hand he holds the paw of a tiny hand-made mohair teddy bear, with working joints, glass eyes, a newspaper hat and a miniature American flag made of silk. I made the spun cotton girl, the paper dolls, and the teddy bear. The feather trees and silk flag are purchased commercially made reproduction components. 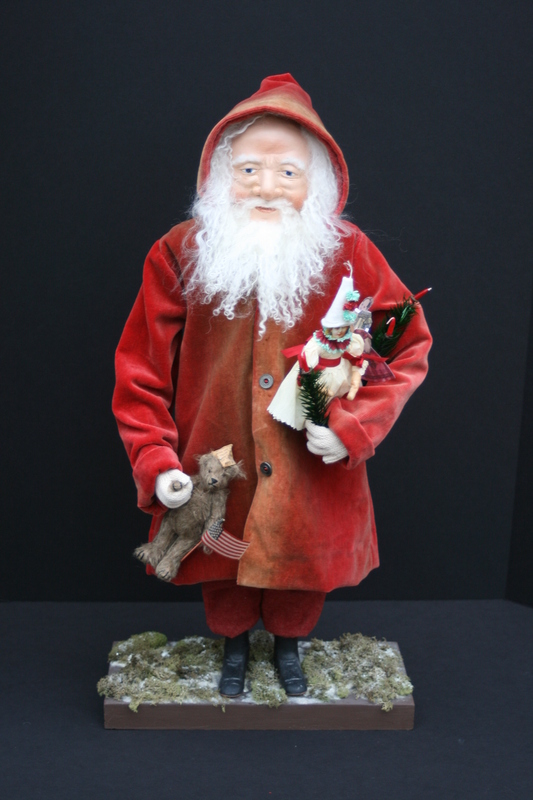 This is a 17 inch tall candy container made of spun cotton and papier-mache. A. 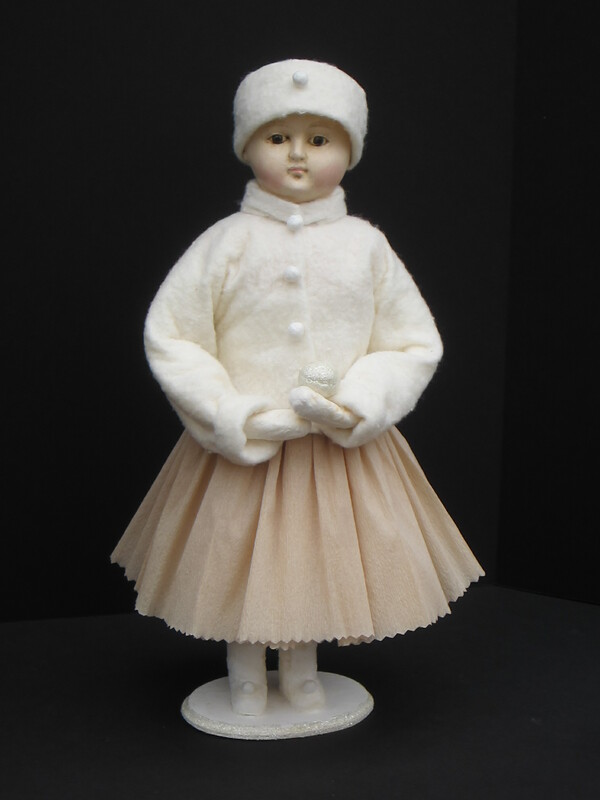 This young lady is a 17- Inch tall candy container doll. The papier-mâché head of this candy container was cast in a mold that I made directly from an antique doll head that I restored prior to making the mold. The head is painted with artist oils. The body of the candy container is made from two graduated cardboard cylinders. Her arms and legs are spun cotton with wire armatures. 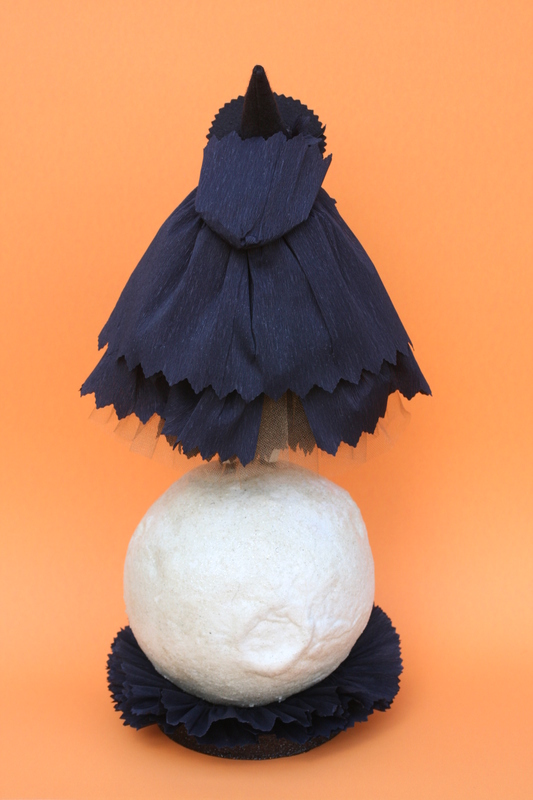 The darker top layers of her skirt are vintage crepe-paper, with newer crepe-paper petticoats underneath. 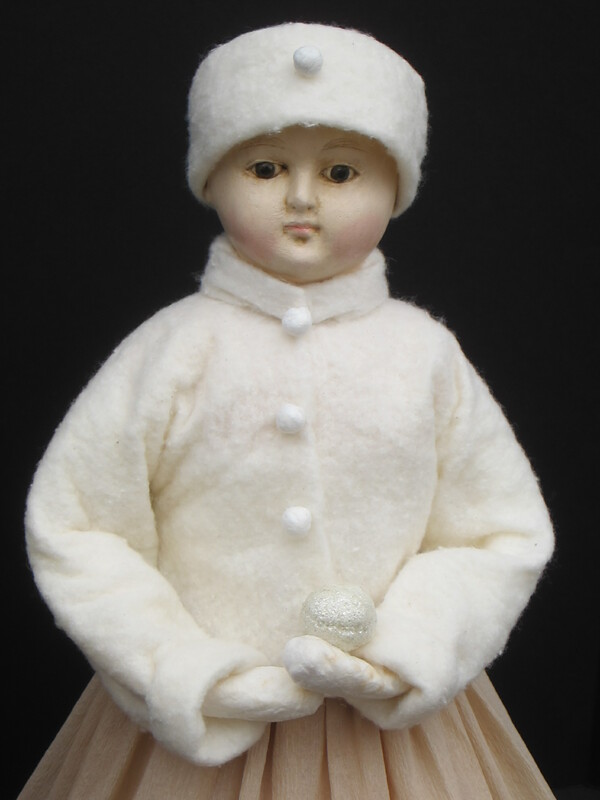 Her jacket and hat are made from cotton batting with hand-made spun cotton snowball accents. 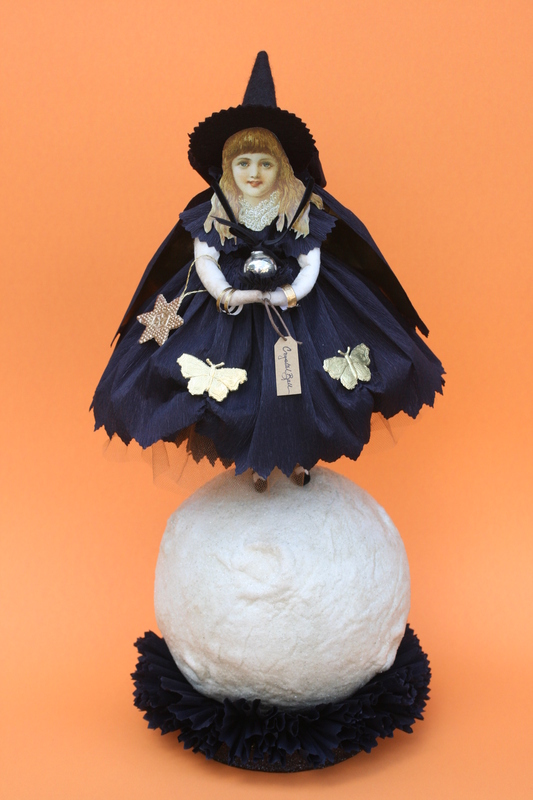 She holds a mica dusted spun cotton snowball in one hand. This candy container is not an exact reproduction. I deviated from the original on which it is based by using papier-mâché to cast the head rather than bisque, to make the head lighter weight. I used a slightly different antique doll head from the original to make my mold. I changed the size of the candy container to keep the doll in proportion to the head I used. I used a wood base, rather than cardboard, for more stability and I added mica around the edge of the base and to the large snowball she holds in her hand. 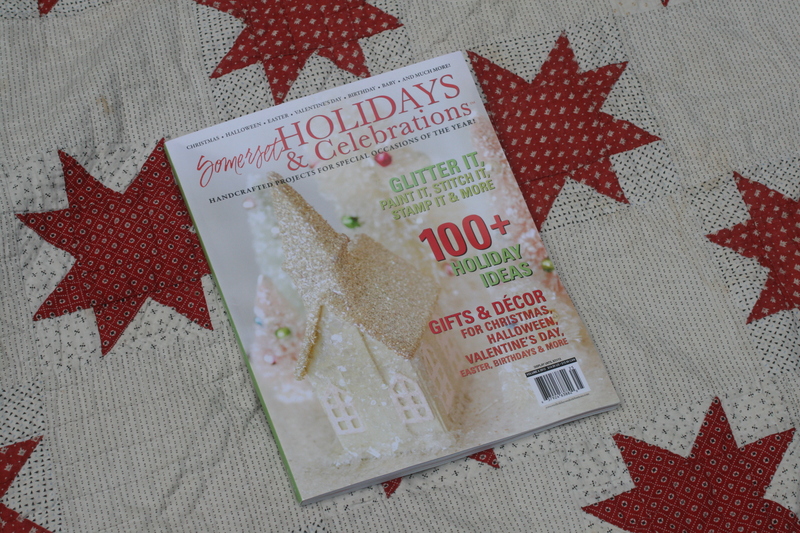 Last winter I became interested in the history of cotton wrapped Christmas trees. Not exactly spun cotton ornaments, but still a related craft. 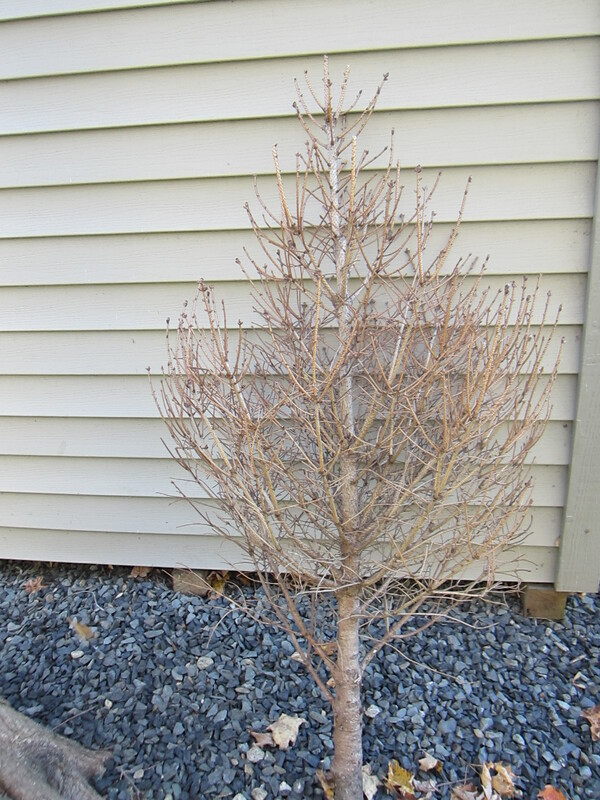 So in the interest of experimentation, I saved one of my Christmas trees. After almost a full year, it is finally needle free! So far the one thing I have found out for sure is that it’s really hard to keep certain family members, you know who you are, from throwing away a dead Christmas tree – even if you hide it!!! A Valentine for my Spun Cotton students! 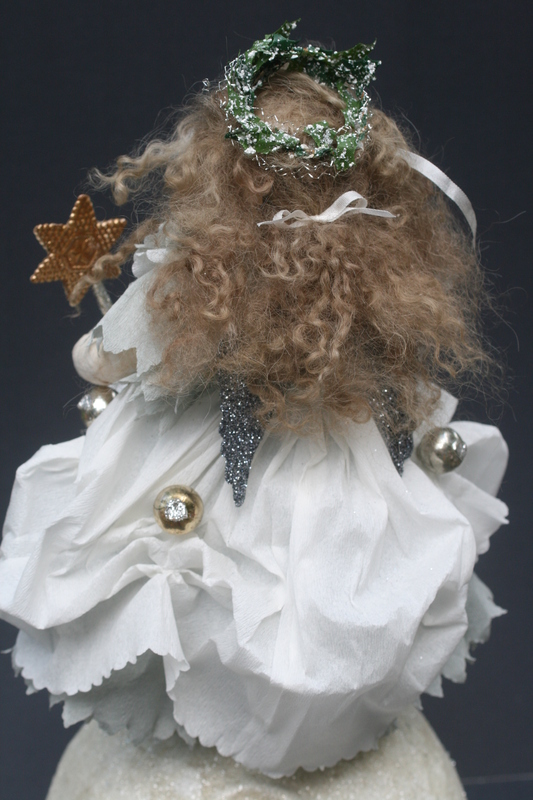 Step by step instructions for this mixed media ornament are posted on the class site. 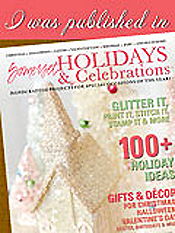 See “Moonstruck” in the Halloween section of the new 2012 issue of Somerset HOLIDAYS & Celebrations. Want to read more? Here are some additional details that you won’t see in the magazine. For those of you who aren’t familiar with it, chromolithography came into being in early 19th century Germany at the hands of Alois Senefelder , who amazed the world and forever changed the printing industry. Others quickly followed Senefelder in the field of color printing, including Parisian Godefroy Engelmann in the 1830’s. Soon thereafter, small color scraps – bits leftover from larger printing jobs, which were too precious to be thrown out and too valuable give away, began to be sold in Germany. The die cut, glossy printed-paper images were bought by bakers who used them for wrapping special breads. For example Easter breads were wrapped in paper decorated with a scrap showing a spring scene. From the 1830’s onwards, collectors eagerly sought these tiny chromolithographs. Color scraps, or chromos, found an enthusiastic market in nineteenth century America, where they were pasted into blank friendship books, which it was customary to pass around amongst friends and family members. Soon special books were being made for scrap collectors, which were called scrap albums or scrapbooks! My name is Paula Walton. 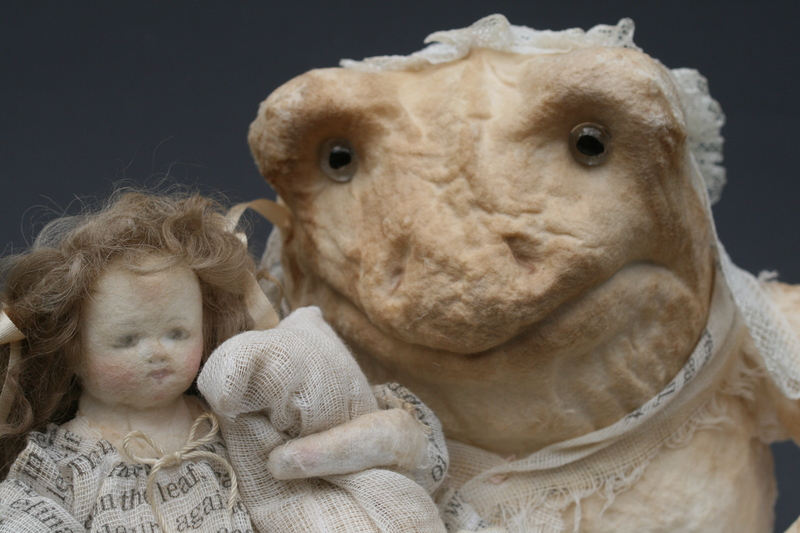 I’ve been a doll maker for 26 years. 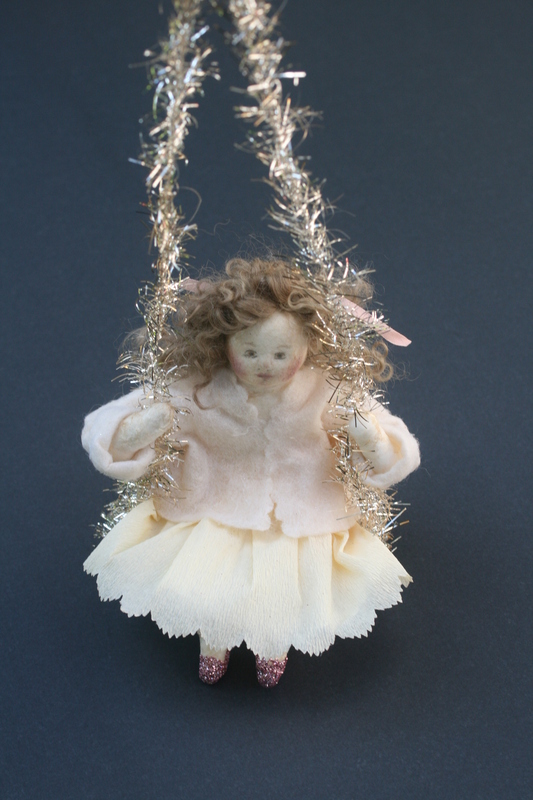 More than a decade ago I developed a fascination with the art of spun cotton ornaments. Because there is very little information available about the way spun cotton was crafted, I taught myself the technique by studying antique ornaments. 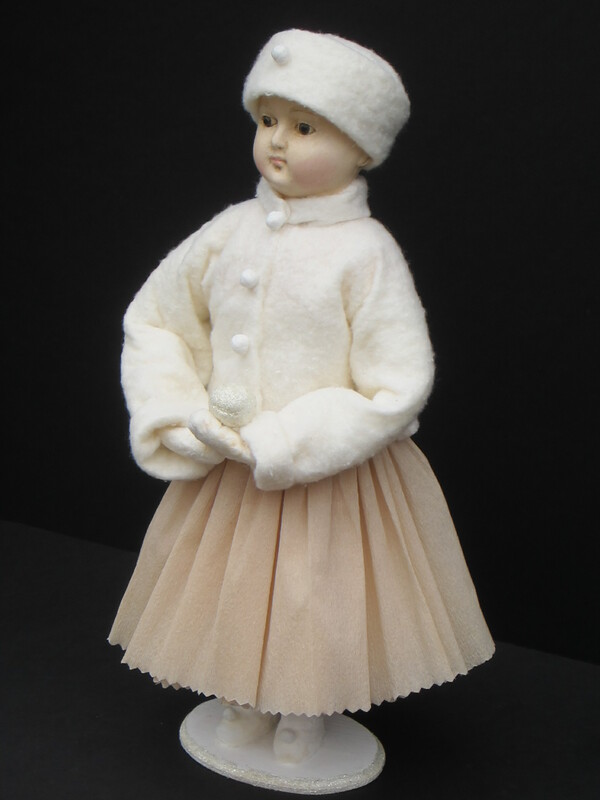 Since then I have been gleefully creating spun cotton figures and enthusiastically teaching others to do so too. My ornaments can be seen at my website http://www.asweetremembrance.com and here on my blog. 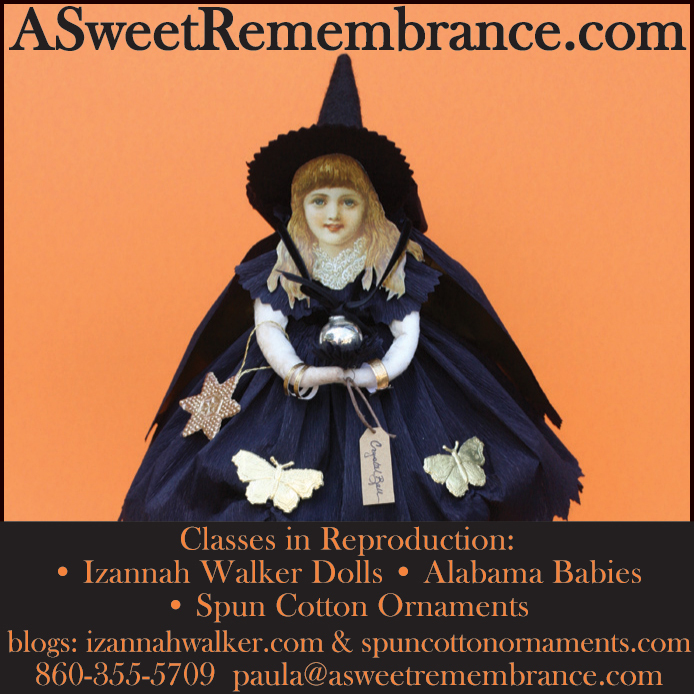 I also have a special online discussion site for all my spun cotton students. 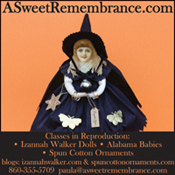 I may be reached by emailing paula@asweetremembrance.com. 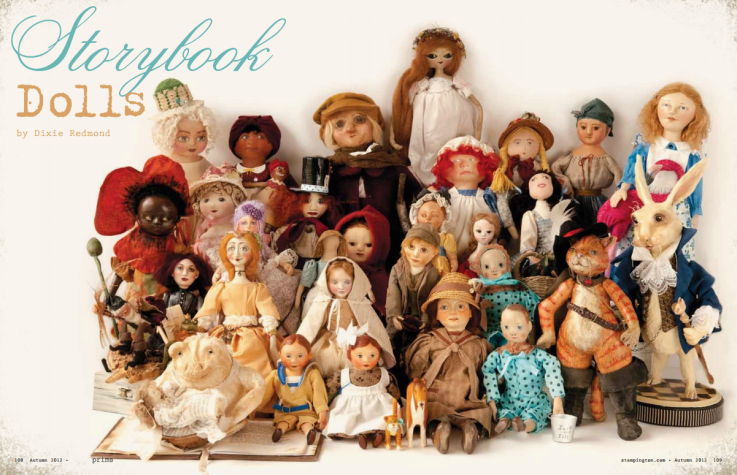 Over the winter I took part in a storybook doll making challenge with a great bunch of doll makers who are members of MAIDA. 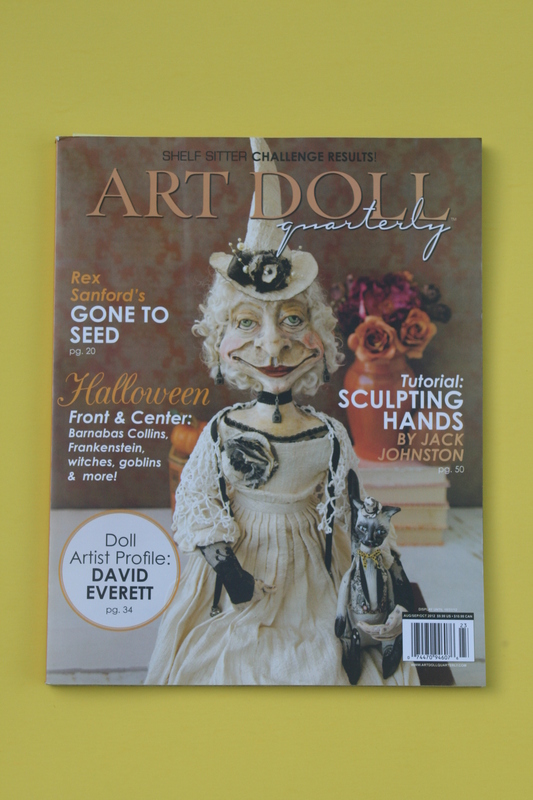 The majority of the challenge group submitted their dolls to Prims magazine and I am honored to say that my Thumbelina and Horrible Mother Toad are pictured in the article about the challenge. 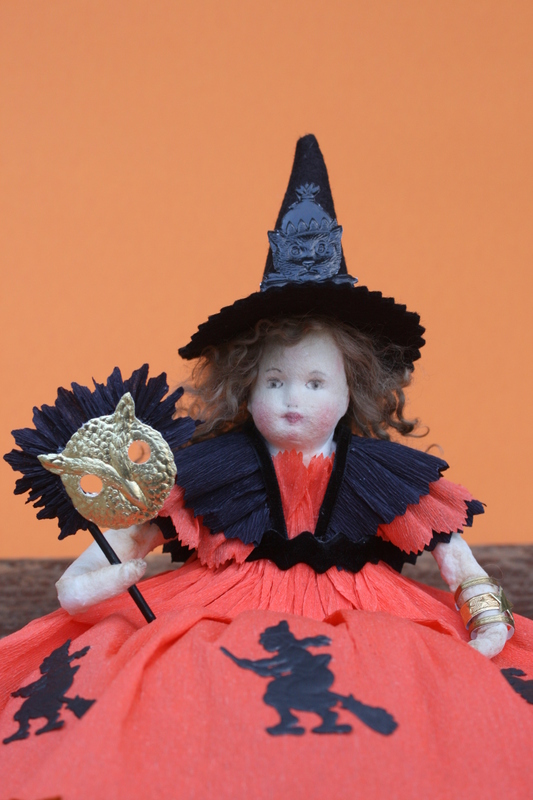 Each and every doll created for the challenge is wonderful and it was a delight to see them come to life and chat about all the trials and tribulations that happen during the creative process. 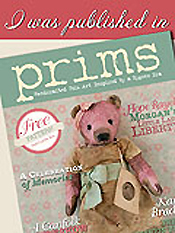 The Autumn issue of Prims goes on sale September 1st. 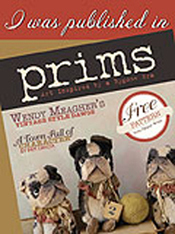 If the article peeks your curiosity and you’d like to know more about the MAIDA Prims Storybook Challenge, pop over and join MAIDA (it’s free) then settle down to read through all 123 (so far) pages of discussion :)!!! Thumbelina is an original fairy tale written by Hans Christian Andersen, first published by C. A. Reitzel on December 16, 1835 in Copenhagen, Denmark with “The Naughty Boy” and “The Traveling Companion” in the second installment of Fairy Tales Told for Children. 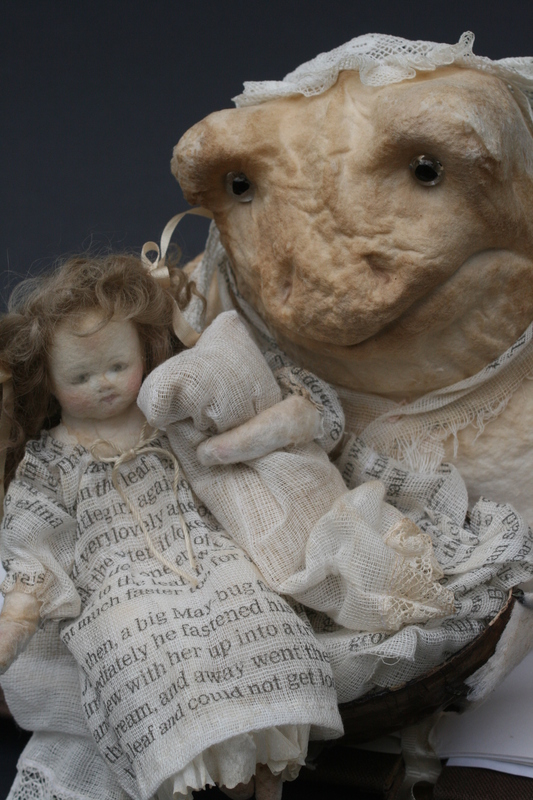 “One night as she lay in her cradle, a horrible toad hopped in through the window-one of the panes was broken. This big, ugly, slimy toad jumped right down on the table where Thumbelina was asleep under the red rose petal. 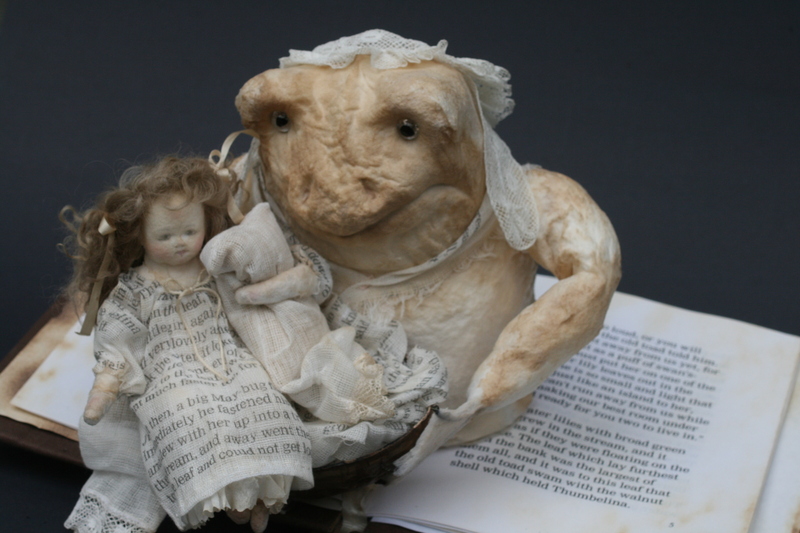 My version of Thumbelina and the horrible mother toad that kidnapped her are both spun cotton figures. 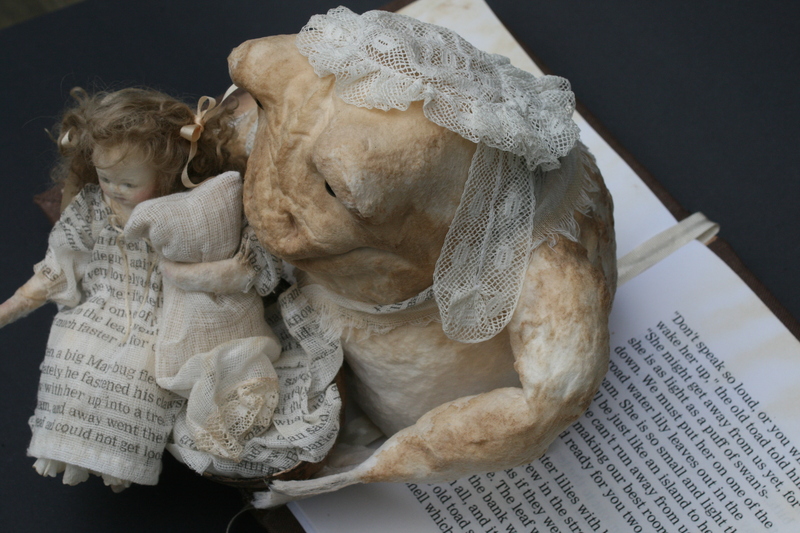 I wanted my dolls to look as if the words of the story had come up off of the page and sprung to life. 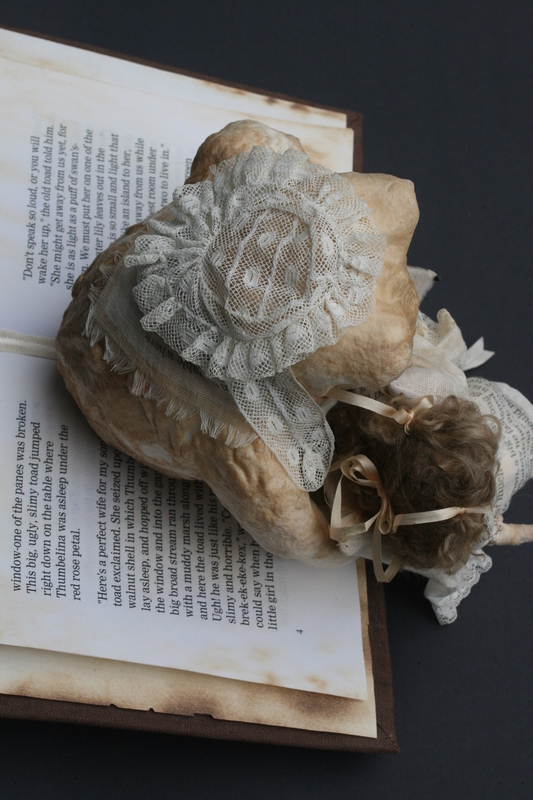 My intent was to create dolls with the fragile feeling of an old book: monochromatic, papery, worn and aged. To do this I made spun cotton figures with wire armatures that I dressed in gauze that I had printed with text from the story. Because all fairy tales are known to have happened “once upon a time” I created 18th century clothing and accessories for my figures, even though the story was not published until 1835. Thumbelina is wearing a cotton gauze chemise over a white crepe paper chemise. She has silk ribbons tied in her hand dyed mohair hair. 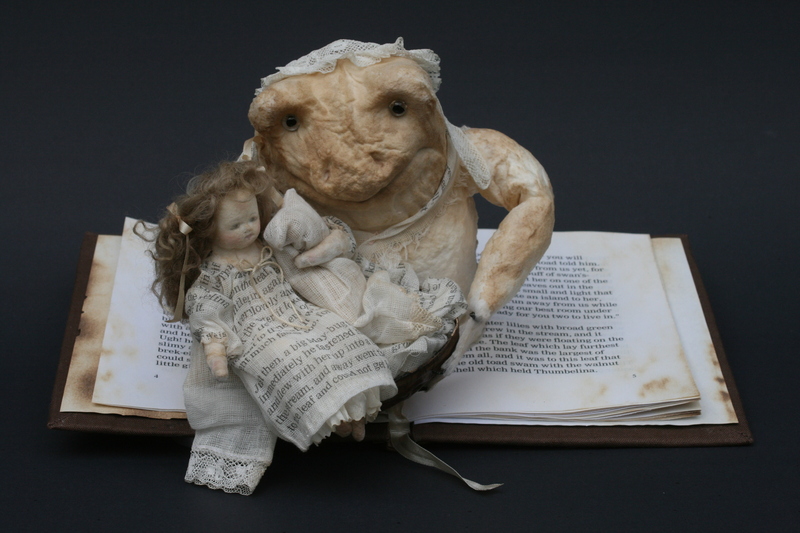 Mother Toad is dressed in a lace cap with lappets and a cotton gauze neckerchief. I achieved all of the coloring and shading on both figures with washes of tea and coffee. Thumbelina’s features are done in pencil to capture the feeling of a three-dimensional book illustration. Her walnut shell cradle is half of a German papier-mache candy container that I painted and then stained with walnut shell ink. The bed linens are made from striped cotton “ticking”, lace, and gauze – plain for the pillowcases and story text printed for the sheets. 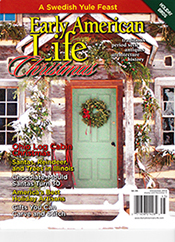 I have more good news to share 🙂 I’ve just received notification from Early American Life that I have been chosen for their 2012 Holiday Directory of Traditional American Crafts in two categories, both Halloween and Christmas! This is the marks the 27th and 28th times that I have been juried into the Directory. Thank you Early American Life! 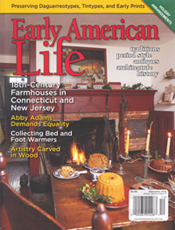 The Christmas issue of Early American Life, which includes the Holiday Directory, will be for sale on September 11th. 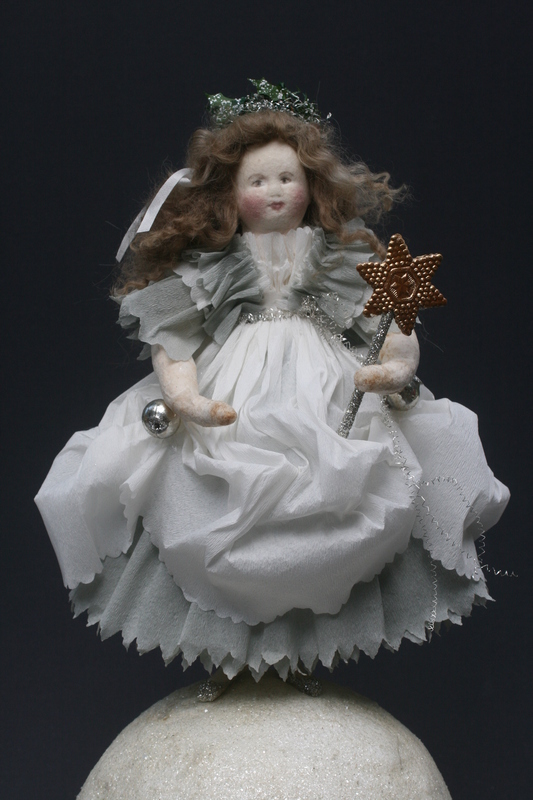 This figure is a 15-inch high freestanding “Christmas Fairy” decoration. 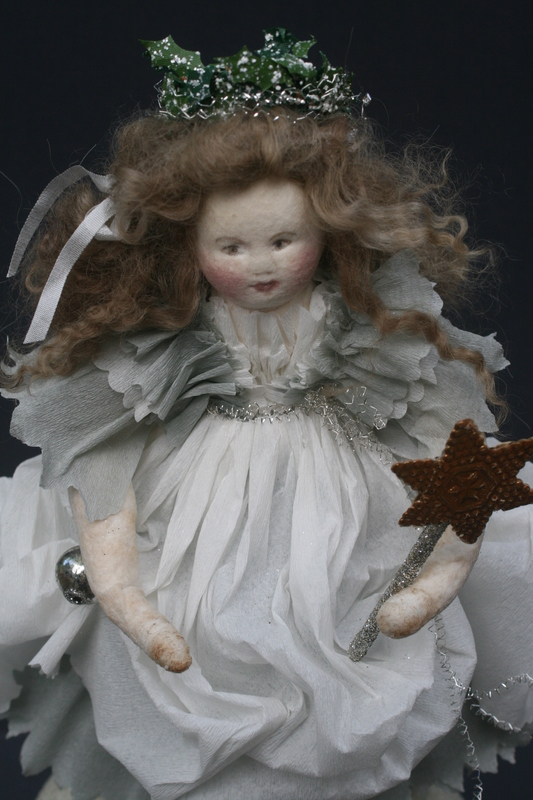 She has a pressed cotton face, hand dyed mohair hair tied with silk ribbons, and a crown of holly leaves and silver bullion wire. Her body is spun cotton over a wire armature. 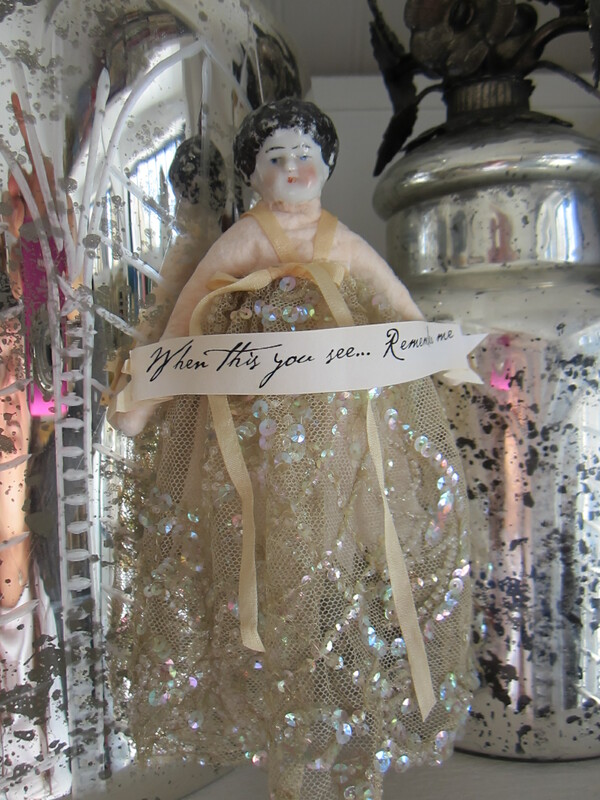 Standing upon a mica dusted spun cotton moon, she is wearing a party frock comprised of layers of crepe paper – with edges cut using an antique pinking machine, adorned with vintage miniature glass Christmas balls. Her shoes and wings are made of silver glass glitter. 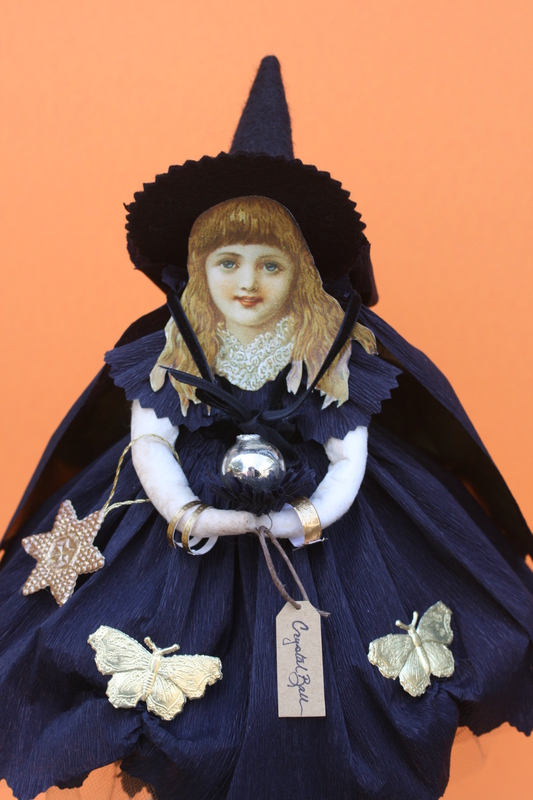 The stars on her wand are antique Dresden paper trim. These ornaments are so new that they are not even up on my website yet 🙂 Email me at paula@asweetremembrance.com if you are interested in having me make one for you. 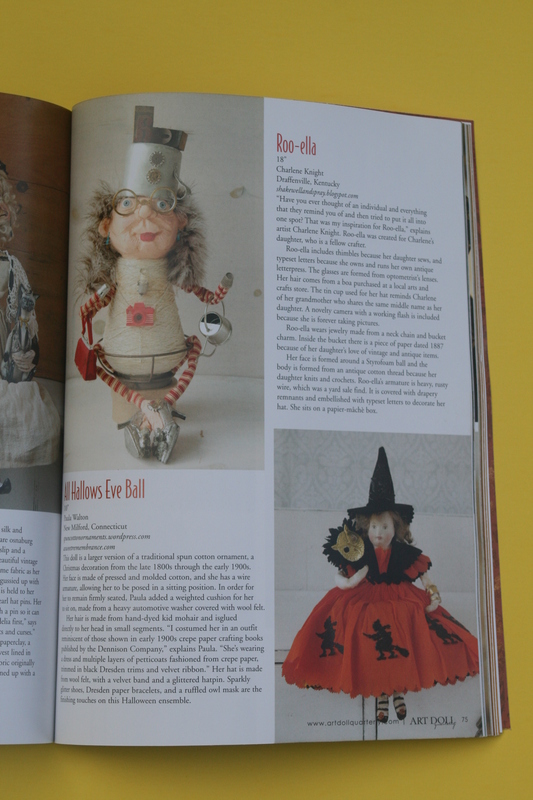 You can see and read all about my All Hallows Eve Ball spun cotton figure in the Autumn issue of Stampington Company’s Art Doll Quarterly magazine. She is located on page 75, as part of the article on the Shelf Sitter Challenge. 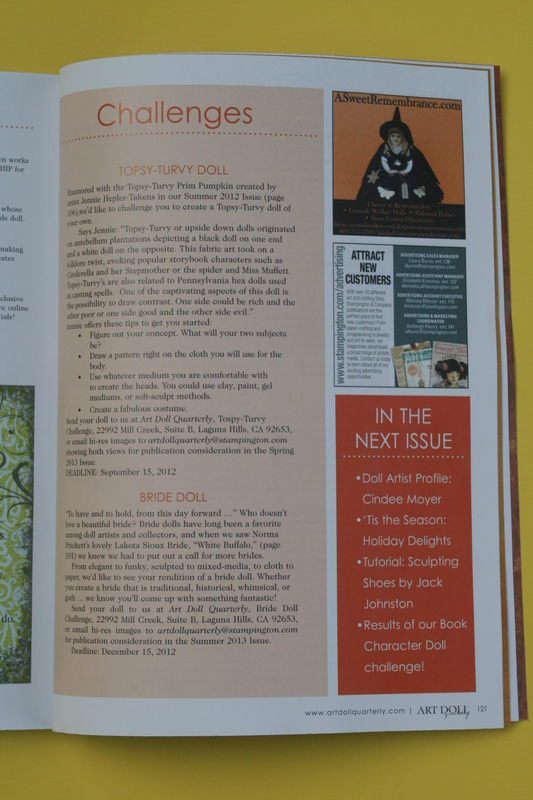 Thank you Art Doll Quarterly, it’s a treat to be included in this issue!!! 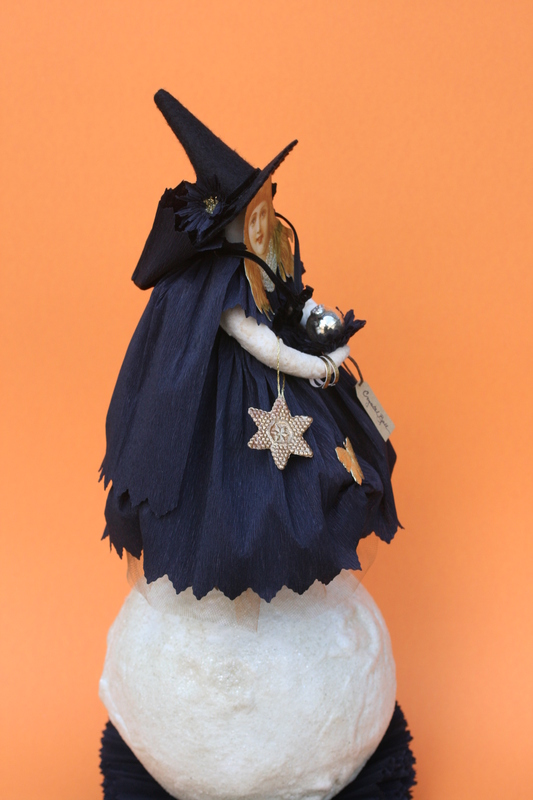 This doll is a larger sized version of a traditional spun cotton ornament, which I created especially for the Shelf Sitter Challenge. Her face is made of pressed and molded cotton. 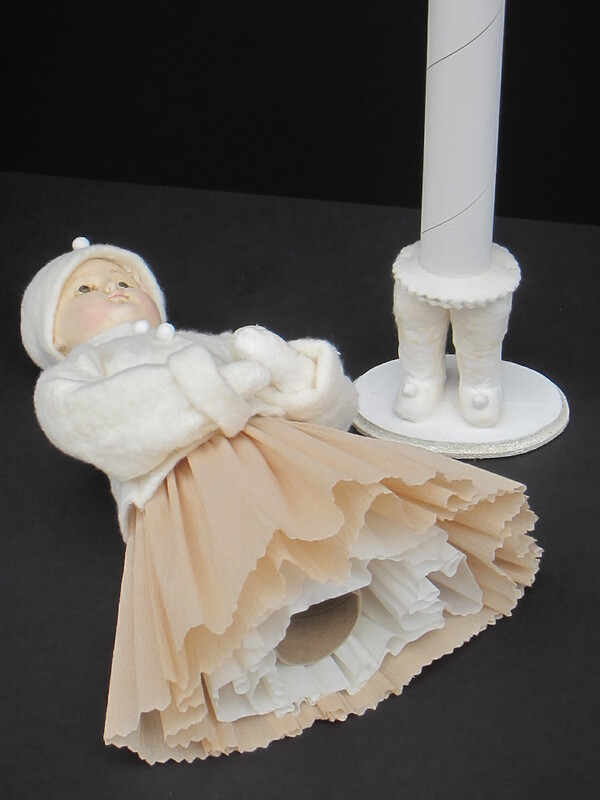 Like all spun cotton figures, she has a wire armature, which allows her to be posed in a sitting position. In order for her to remain firmly seated, I have added a weighted “cushion” for her to sit on, made from a heavy automotive washer that I covered in wool felt. Her hair is made from hand dyed kid mohair, which I glued directly to her head in small segments. I costumed her in an outfit reminiscent of those shown in early 1900’s crepe paper crafting books published by the Dennison Company. 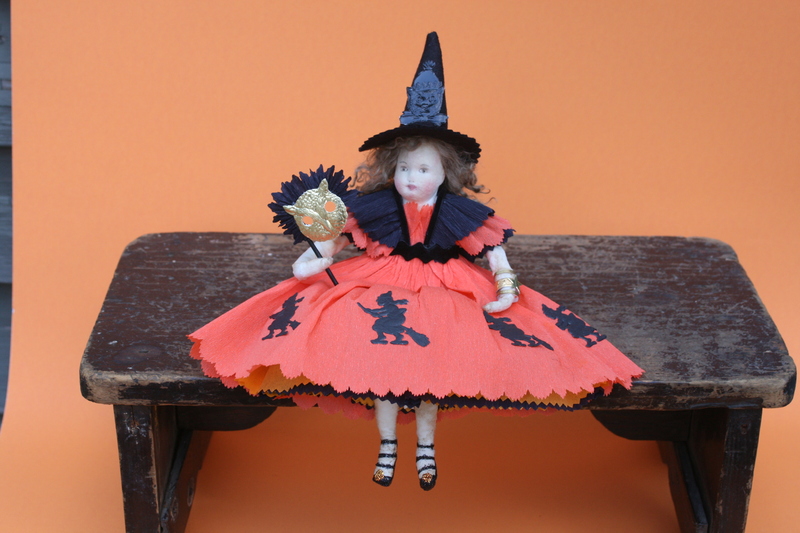 She is wearing a dress and multiple layers of petticoats fashioned from crepe paper, trimmed in black Dresden trims and velvet ribbon. 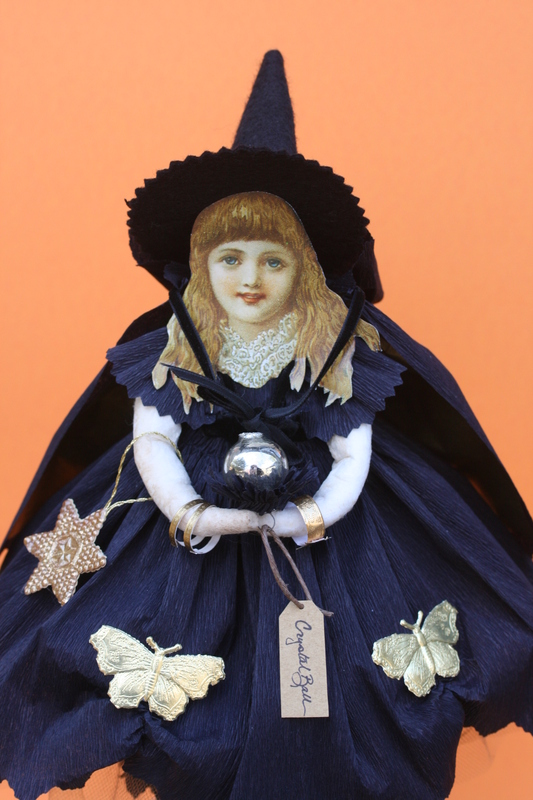 Her hat is made from wool felt, with a velvet band and a glittered hatpin. Sparkly glitter shoes, Dresden paper bracelets, and a ruffled owl mask are the finishing touches on her Halloween ensemble. Spun cotton ornaments, which were generally Christmas decorations, were popular from the late 1800’s through the early 1900’s. They were inexpensive and unbreakable which made them perfect for small children and as decorations on the lower branches of a Christmas tree. Originally they were a cottage industry, made in people’s homes in and around Lauscha, in the Thuringian mountain region of Germany. The ornaments were made by spinning cotton fibers around wire armatures, with faces of spun cotton, bisque facemasks, or chromolithographed paper scraps. They were frequently adorned with crepe paper and Dresden paper trims. More information about spun cotton ornaments, including a list of reference books, can be found here at my blog, http://www.spuncottonornaments.com. 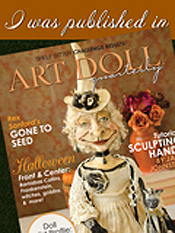 I always especially enjoy the Autumn issue of Art Doll Quarterly, and 2012’s is no exception. I just love Halloween! The official release date for the magazine is August 1st.